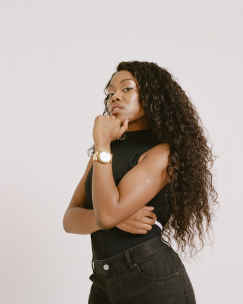 After months of emails, calls, and rescheduled plans, I am waiting for Lady Leshurr at a sun-filled photography studio in London. 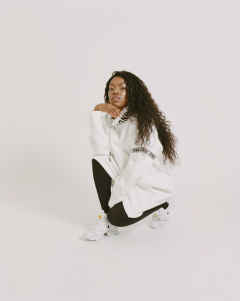 Racks of neatly pressed designer clothes line the wall, a few feet away a vanity table glistens with powders and creams, and like a red carpet, the Colorama is rolled out for the queen of British rap to step into frame. An hour passes and the looming possibility of a no-show sends a ripple of nervous glances around the room. 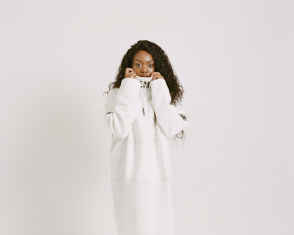 Suddenly my phone buzzes, the first lady of grime has arrived. 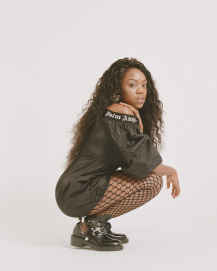 When Leshurr enters from an adjacent lift, she is a petite, bare-faced beauty, coiling in her own shyness; a stark contrast to the feisty straight-talking MC known for the highly original disses and cutting cultural commentary of her infamous Queen’s Speech YouTube series. 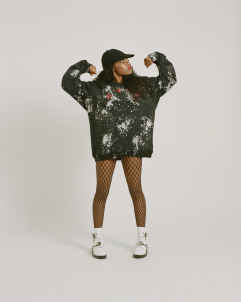 Here we discuss self-respect, coming out, and breaking down barriers in the UK grime scene. Lady wears Giuseppe Zanotti boots, MM6 Maison Martin Margiela jeans and Ward Whillas suimsuit. 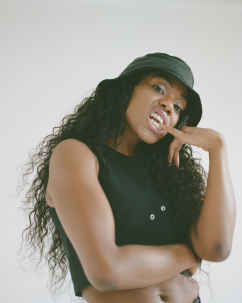 Top Image: Lady wears Acne Studios hat and Versus top. 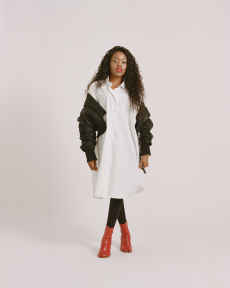 Lady wears Maison Margiela boots, Acne Studios jacket and Maison Margiela dress. Lady wears Balenciaga boots, Balenciaga hoodie and Gentle Monster sunglasses. Lady wears Opening Ceremony dress. Lady wears Balenciaga boots, Christian Dada hat, 032c sweater and Wolford tights. Lady wears MM6 Maison Martin Margiela jeans and Ward Whillas suimsuit. Lady wears Balenciaga boots, Palm Angels dress and Wolford tights.